A glowing welcome is underway to welcome the arrival of Taiwan’s first-ever international boat show coming May 8 to 11 to the Kaohsiung Exhibition Center. The current promotion in downtown Kaohsiung from April 18 to 20 is launched by Taiwan External Trade Development Council (TAITRA) to underscore Taiwan’s boat show as the crowning event of six decades of industry in yacht making. With this pre-show outdoor promo campaign comes a flotilla of scale-model yachts that are being displayed at Hanshin Arena Shopping Plaza. This micro-fleet of 10 mini-yachts — by Horizon, Kha Shing, PRESIDENT, TAYANA, Johnson, Ting Hai, Corum and Shing Sheng Fa give a sneak peek of Taiwan’s world-renowned shipbuilding craftsmanship. And with them comes ARITEX, Asia’s largest yacht part manufacturer who is throwing in the anchor to mark the launch of the Taiwan Int’l Boat Show, a milestone in the country’s yacht-building history. Success of the May show is certain since it combines full support from central and local governments and the industry. It’s organized by the Bureau of Foreign Trade and Kaohsiung City Government, implemented by TAITRA and held under the auspices of Taiwan Yacht Industry Association. 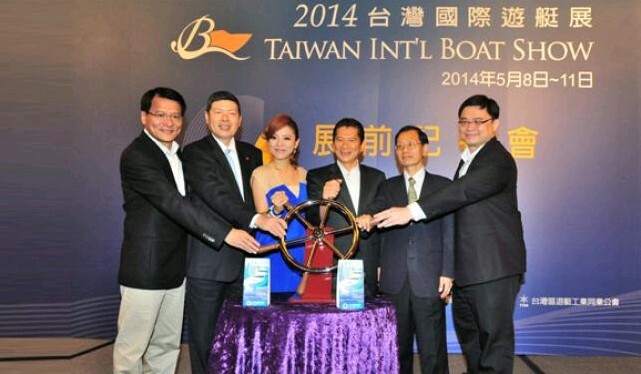 The show will undoubtedly enhance the global competitiveness of the Taiwanese yachting sector. Already May’s show has already won much enthusiasm and pre-registration from boat companies from home and abroad. Taiwan’s yachting industry holds global acclaim for its quality production that dates back six decades. The ShowBoats International’s report showed that Taiwan filled orders for large yachts (80-foot or longer) totaling 5,656 feet in length in 2014, making it the world’s 6th largest and Asia’s top yacht-manufacturing hub. The first Taiwan International Boat Show brings together these strengths to further profile the island’s incredible output. Those visiting the Kaohsiung Exhibition Center this May will be treated to all ranges of large yachts and yacht-related products or services that are featured in the 27-meter-high, pillar-less South Hall and North Hall in conjunction with an on-the-water yacht exhibit at Wharf 22. The show hosts 27 Taiwanese, Swedish and German shipbuilders who are displaying 60 luxury yachts, sailboats and power-driven vessels both indoors and at the pier. Meanwhile, 139 component and equipment suppliers from Taiwan, Australia, the U.S., New Zealand, UK, Italy, Singapore, Hong Kong, China and Indonesia are going to turn the exhibition floors into a treasure trove of hardware, generators, engines, underwater propellers, navigational instruments, radar devices, radio systems among other electronics, interior remodeling or design solutions, ship furnishings, maintenance equipment/services and maritime recreation amenities. Get your elite yacht, villa & Maserati! Joining it is luxury residence provider GREATSUN Architecture Co. that offers the show’s one and only titanium sponsorship through a cross-industry partnership, targeting upscale consumers visiting this unprecedented event. And nearby further emphasizing the elegance of the yachting event is a Maserati sports car show presented by Modena Motori, the holder of this iconic Italian brand’s exclusive distribution rights in Taiwan. Many in Taiwan will be astonished to learn of the country’s rich maritime heritage. Taiwan, a nation surrounded by water, shaped by maritime history, and boasts a wealth of maritime resources. The show’s forums and many related events are tailored to different demographic groups, for both beginners and advanced yachting enthusiasts. For instance, the exciting Knowledge Box offers a rare peek into the maritime entertainment sector with expert guidance on recreational marine activities, yachts and sailboats. Meanwhile the “Sailing Experience Sharing,” unfolds a workshop lead by Captains Nelson Liu, Ding Shawn Lin and Sylvia Utoto Tsui, among other prominent figures in Taiwan’s sailing sectors. They all share a rare passion for marine navigation. Boating industry experts will also address the county’s new yachting regulations and maritime entertainment with a focus on yacht marketing, regulations, safety, business practices and fishing-port empowerment. Tickets for the Public Available via iBon Kiosks in Convenience Stores The first Taiwan International Boat Show will be open to both industry insiders and the general public across Taiwan. Participants from overseas and Taiwanese boating-related companies may register online to gain admission confirmation and get their own badges at the venue. The general public is advised to pre-order tickets through ibon kiosks at 7-ELEVEN convenience stores. In addition to the NT$250 early-bird offer valid from April 7 to 27, a special NT$300 pre-order price is available from April 28 to May 7. During the exhibition, tickets of NT$380 can be purchased at the door.